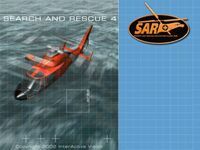 Search and Rescue Coastal Hero's is the fourth installment in the Search and Rescue series. As in the other games you can fly with one of three real helicopters: the HH-65A Dauphin, Sikorsky SH-3 Sea King, and the BK-117 C-1. You can fly a free flight or can do a search and rescue mission. You can start a campaign as a US Coast Guard Pilot and raise you're position from Ensign to Aircraft Commander.